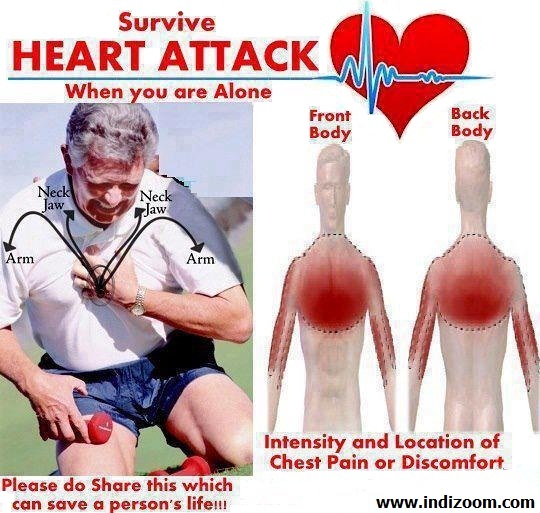 Browse » Home » Health and Fitness , How to Guide-Health » HOW TO SURVIVE HEART ATTACK WHEN ALONE? Let's say it's 6.00pm and you're going home (alone of course),after an unusually hard day on the job. You're really tired, upset and frustrated. Suddenly you start experiencing severe pain in your chest that starts to drag out into your arm and up into your jaw. You are only about five miles (8kms) from the hospital nearest your home. Unfortunately you don't know if you'll be able to make it that far. You have been trained in CPR, but the guy that taught the course did not tell you how to perform it on yourself..!! NOW HOW TO SURVIVE A HEART ATTACK WHEN ALONE....!! Contribute by Sharing this which can save a person's life! !